The two Democrats, on the right in the photo, might split the Democratic votes allowing the Republican, on the left in the photo, to steal the election by windfall even though a wide majority vote Democrat. 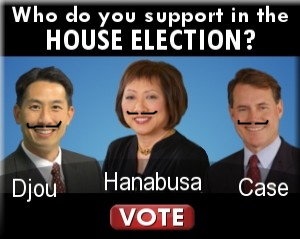 Usually....the top two vote-getters advance to a run-off election....but not here in Hawaii. the 3 of us in my home voted for ED CASE!!! We're in Illinois right now and didn't vote this time. My mom in Hawaii says the political phone calls have been driving her absolutely nuts. gigi- I have a bridge to the Big Island to sell you. Nate- I have a bridge to Maui to sell you. Kay- actually, it's a mail-in ballot election. You've probably have received a ballot in the mail. No kidding? I am so out of it. Kay- go check. Ballots have to be received by May 22, not post-marked.